Best video editing software application for Linux - There's windows movie maker for windows and iMovie for Mac users as video editor. Also can use Adobe Premiere can choose. What about Linux users? Ok! if you're using Linux as your Operating system, and Looking for some cool video editor likes Adobe Premiere Pro, Apple iMovie, or Microsoft Movie Maker under Linux to work and (or) making home movies, you've come to the right page. 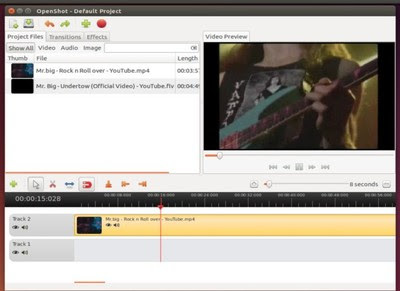 OpenShot Video Editor is free software that you can redistribute it and/or modify under the terms of the GNU General Public License as published by the Free Software Foundation. This software support many audio, video and image formats. You can cutting, trimming, cropping and snapping easily. OpenShot also supports 3d effects, video transition, compositing, and motion picture credits. The picture above is screenshot of OpenShot taken from my Ubuntu 15.04 Vervet Vivid. What about the OpenShot features? Check this out! 0 upgraded, 26 newly installed, 0 to remove and 225 not upgraded. Need to get 37,3 MB of archives. After this operation, 124 MB of additional disk space will be used. The second you can choose is Kdenlive. 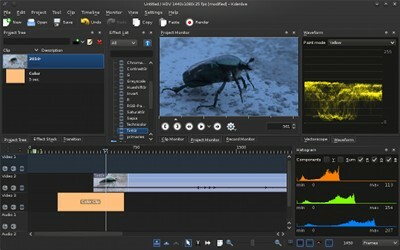 Kdenlive is an intuitive and powerful multi-track video editor, including most recent video technologies, completely free, as defined by the GNU foundation. It supports a lots of file formats. It supports a wide variety of file formats and a wide range of camcorders and cameras including Low resolution camcorder (Raw and AVI DV editing), Mpeg2, mpeg4 and h264 AVCHD (small cameras and camcorders), High resolution camcorder files, including HDV and AVCHD camcorders, Professional camcorders, including XDCAM-HD™ streams, IMX™ (D10) streams, DVCAM (D10) , DVCAM, DVCPRO™, DVCPRO50™ streams and DNxHD™ streams. The picture above is screenshot of Kdenlive. Next point about the features. Here we go! Tools to create, move, crop and delete video clips, audio clips, text clips and image clips. 18 upgraded, 122 newly installed, 0 to remove and 207 not upgraded. Need to get 90,4 MB/90,4 MB of archives. After this operation, 243 MB of additional disk space will be used. 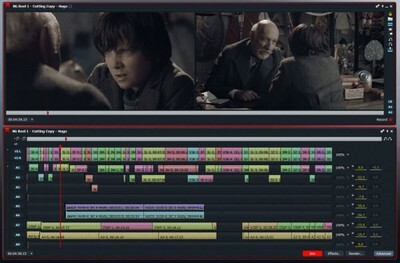 Lightworks is a professional-grade video and movie editor which recently released a beta version for Linux. For Lightworks beta video editor is free to download and use, and their is a PRO paid plan offering which gives you extra codec support and features. You can see the price from they site at www.lwks.com. So the picture above is screenshot of Lightworks video editor software application. Dedicated Web Export (MPEG4/H.264). Share your movies with colleagues, friends and family with our super-quick export to MPEG4/H.264. The video files produced are ready-made for YouTube, Vimeo, Facebook and Instagram. You even have the option to upload directly to your YouTube account in one easy step, so you have more time to make a better movie! To install Lightwork in your Linux, you just to go to the download page then choose the package ( .deb or .rpm ) then install it manually. Or see step-by-step tutorial in our new post Install Lightworks Professional Video Editor Ubuntu Linux. That's all I can write about best video editor sofware as alternative Adobe Premier for Linux. Hope you've enjoyed reading this tutorial as much I’ve enjoyed writing it. Thanks for visiting us.